Fully one-in-five Americans have a disability themselves and studies show that most of them want to work. People with disabilities are America’s largest minority group, and the only one that, due to an accident or illness, anyone can join at any time. Indeed, America has 56 million people with disabilities, more than 20 million of whom are working age. Fifty-two percent of Democrats report that they or a loved one have a disability, and for Republicans, a smaller number of 44 percent report they have a disability. Surprisingly, Independents have the largest number of voters who say they have a disability, with 58 percent saying yes. This shows that swing voters with disabilities and their families are up for grabs. 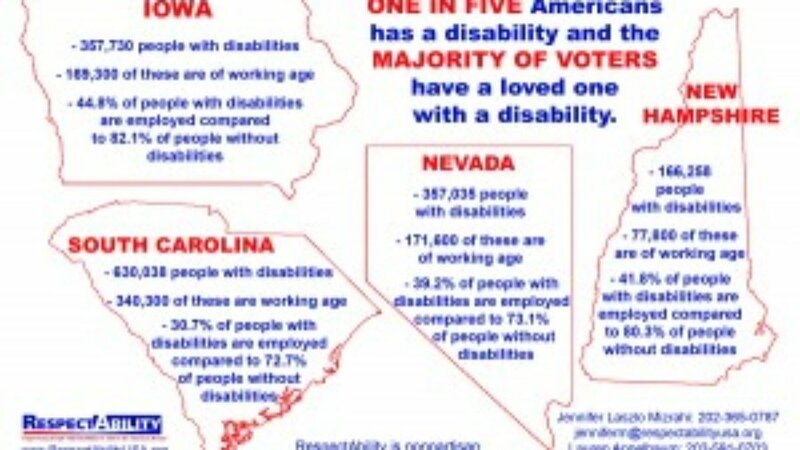 Washington, D.C. – As the 2016 presidential campaign season gains speed, RespectAbility is reaching out to all of the campaigns to highlight the importance for all candidates to speak directly to voters with disabilities and their families by offering specific plans for a better future. 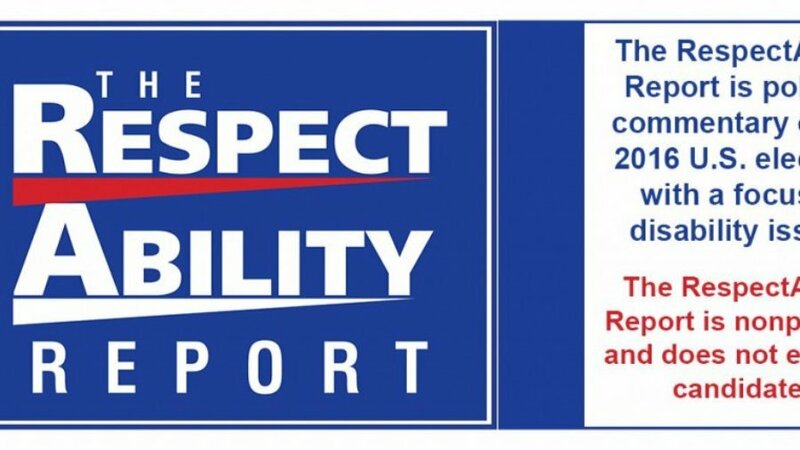 RespectAbility introduces its newest project – The RespectAbility Report – a nonpartisan political commentary on the 2016 U.S. elections with a focus on disability issues. Launched in June 2015, The RespectAbility Report is nonpartisan and neither rates nor endorses candidates. Expect to read fact-based updates and analysis from our staff based around the entire country. Staff writers will meet with the presidential candidates and report their proposals on disability issues. In addition staff writers report from the ground of candidate forums and debates. Other features will look at the candidates’ websites to answer these questions and more: Do the candidates’ websites have plans for helping people with disabilities obtain jobs? Are the sites accessible, and can you use a screen reader? Look for answer to all these, and more, on The RespectAbility Report! Clicking on the link will open a new tab with the report. 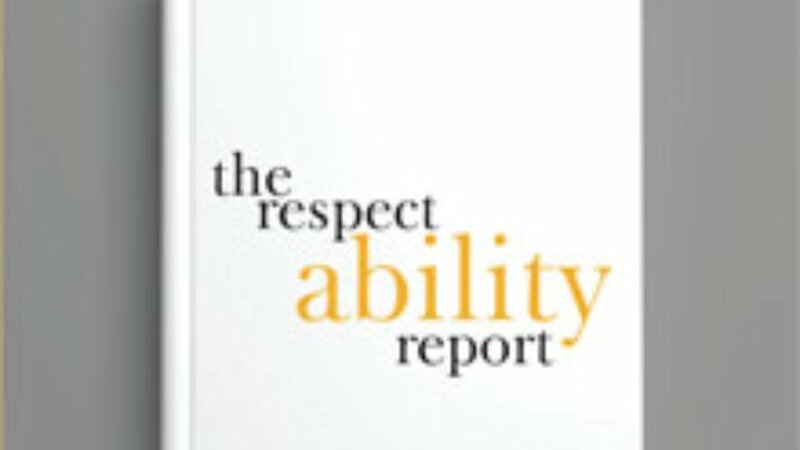 The RespectAbility Report is a nonpartisan political commentary on the 2016 U.S. elections with a focus on disability issues. Launched in June 2015, The RespectAbility Report is nonpartisan and neither rates nor endorses candidates. Chief political writers for The RespectAbility Report include Jennifer Laszlo Mizrahi, former political and training director for Campaigns & Elections magazine and regular columnist for The Daily Record, and Lauren Appelbaum, former political researcher for NBC News. Bethesda, Md. – In the two years since the founding of RespectAbility, the organization continues to flourish and grow. Born in 2013, RespectAbility, a nonprofit organization working to empower Americans with disabilities to achieve the American Dream, works to educate, sensitize and engage Americans to focus on what people with disabilities can do, rather than on what they cannot. 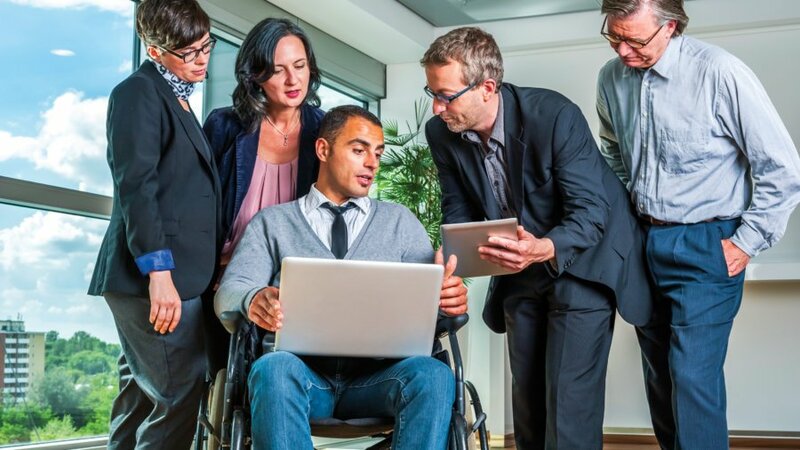 RespectAbility thereby seeks — steadily, and in a practical way — to help increase the number and percentage of Americans with disabilities who engage in gainful employment, start and sustain their own businesses, lift themselves into the middle class, and participate in their communities. Bethesda, Maryland – States around America returned millions of dollars to the federal government that could have been used to enable people with disabilities to get jobs and careers. This is despite the fact that 70 percent of people with disabilities are out of the workforce, and disability benefits and healthcare are costing billions to taxpayers. Vocational rehabilitation and workforce development programs, when resources are allocated to proven best practices, can enable people with disabilities to secure stable employment. In 2012, vocational rehabilitation agencies helped 177,172 Americans with disabilities get jobs and careers. These programs operate by having the federal government match nearly $4 for every $1 that is spent by the individual states. However, if the states fail to spend the money or come up with matching funds, then the funds go back to the federal government. Thank you for your leadership in understanding the challenges of meeting the needs of individuals with disabilities served by home and community-based services (HCBS). 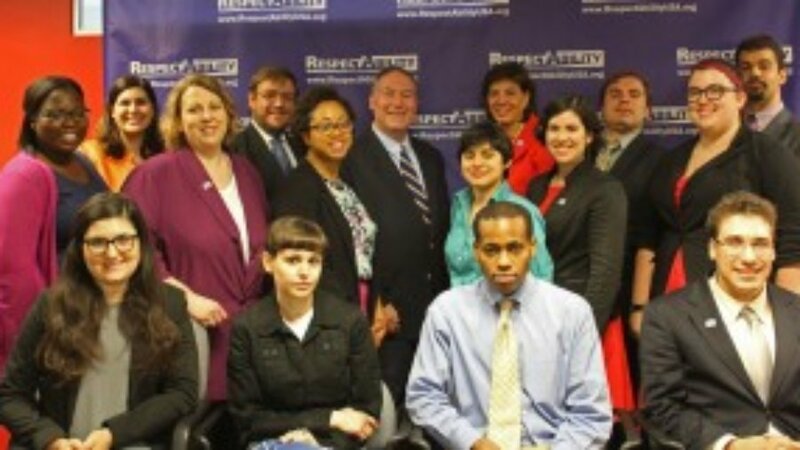 RespectAbility is a nonprofit working to enable people with disabilities to achieve the American dream, just like anyone else. There are 20 million working age Americans with disabilities, many of whom receive long term services and supports (LTSS). As identified in 2013 by the Senate Commission on Long Term Care, forty-four percent of those who utilize LTSS are working age Americans between the ages of eighteen and sixty-five. In the District of Columbia itself, there are 40,200 working age people with disabilities between the ages of twenty and sixty-four. Among this population, only 33.9% are employed. It is important to look at not only working age people with disabilities, but also youth. There are 4,800 District residents with disabilities between the ages of sixteen and twenty. Of that number, each year at least 1,200 young people with disabilities transition out of the educational system and into what should be the workforce. Yet this group faces a number of differences and many barriers in their efforts to live in the community. My heart is bleeding for the people of Baltimore and other communities who are struggling with challenges. We have been paying attention to police violence in Maryland for some time. While we focus on disability issues, we are all a part of our community overall. 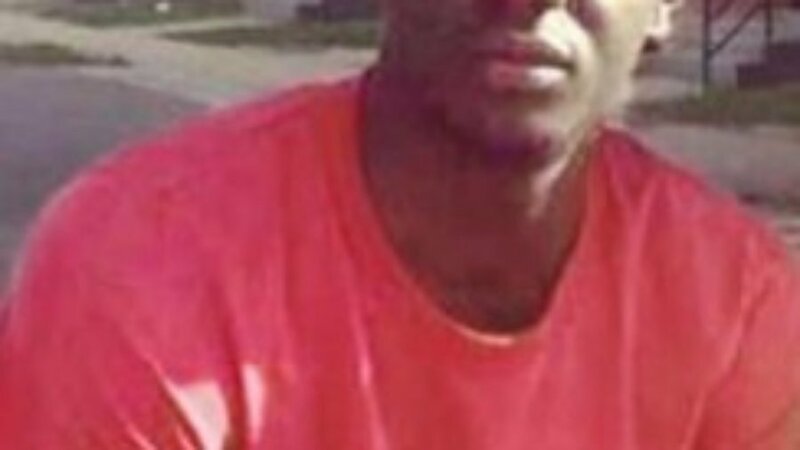 When a young man with Down syndrome was killed by police in Maryland, it was not an isolated incident. Likewise, too many innocents of all abilities and races are being killed. And still, we recognize and value the role of police and the good intentions of the vast majority of those in law enforcement. No grievance – no matter how big or how real – ever justifies violent attacks on innocent people or institutions. We must stand up against violence, and do the hard work to create solutions. No one group can do this alone. We must break down silos and work together. However, we cannot afford to make the mistake of thinking this is just about the tragic killing of Freddie Gray. It is about finding holistic solutions. Never Forget. Live every day to make a difference. Today is a somber day. It’s Holocaust memorial day. 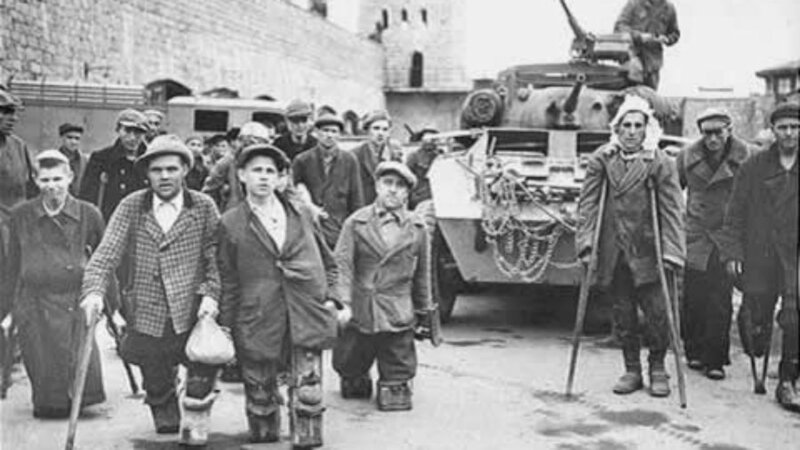 I am so deeply grateful that my father was able to escape the Nazis in 1939. Most of our family on his side was not so lucky. They were killed. I am so grateful to the many allied troops and others who made freedom and survival possible. Without them the world would be a different place. May the memory of all who died be a blessing, may the lessons of that terrible time never be forgotten. 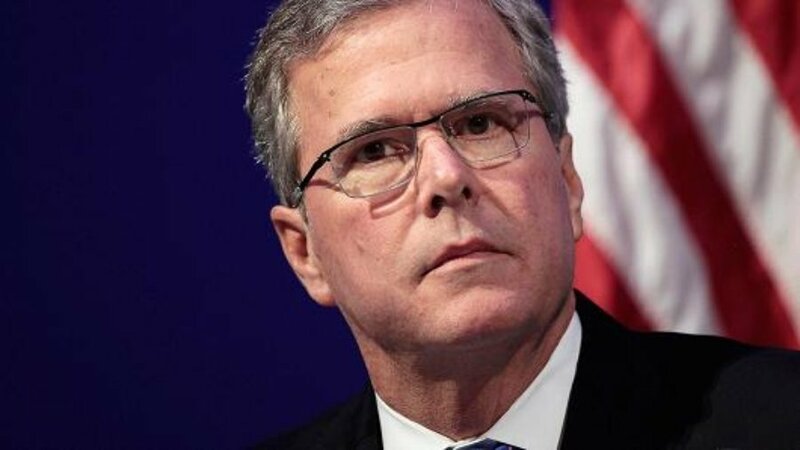 Breaking News: Jeb Bush to reach out on disability issues! Please see the story below about Jeb Bush, who has not yet officially announced his candidacy, doing an event tomorrow to celebrate the Equal Opportunity for Students with Special Needs Act in Mississippi. Earlier Gov. Phil Bryant made Mississippi Employment First for people with disabilities. 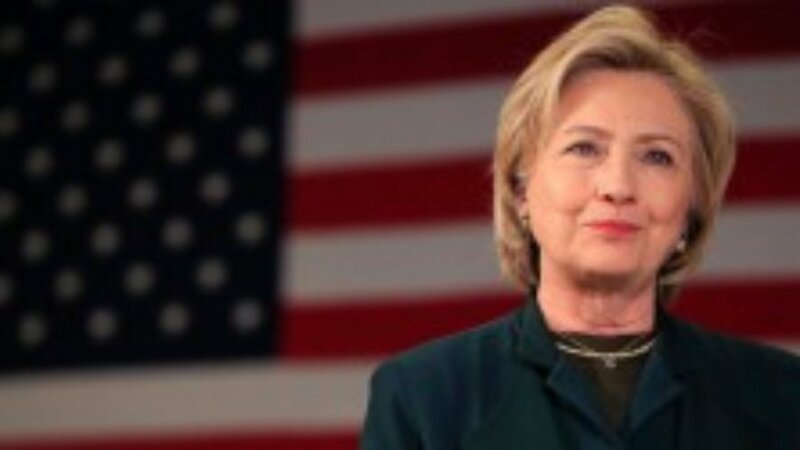 Also make sure to read our piece about Hillary Clinton’s video failing to show people with disabilities here. We will treat all candidates equally, but we want to see ALL of them covering these issues.